How many times have you gone eating out with your pet? Or went on a road trip or socialised with them? 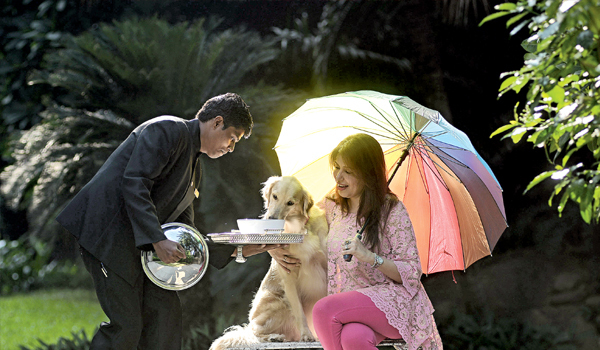 If you are already feeling guilty about not giving quality time to your furry companion at home, Hotel Taj Krishna’s Sunday Pet Brunch is a step in the direction of hanging out with your pet at a fun place. Like WR Purche quoted, a�?Everyone thinks their dog is the best and none of them are wrong,a�? forget the opportunity of having a brunch with your furry love, it also gives a chance to dress them up and flaunt their cuteness to the world. If a pet lover was paid every time their dog made them smile, they would be millionaires now. Keeping this philosophy in view, the hotel has conceptualised a brunch that pampers your four-legged furry friend and you. Starting this Sunday, Taj Krishnaa�?s Gardenia lawns is turning into a p et zone (the first Sunday of every month). As your watch and mobile phone stay on a standby mode, you can enjoy watching your pet jump, run, pant and nuzzle. And while on that, you get to socialise with other pet owners too. There is a scrumptious spread for the pets and the owners. The bow-wow buffet includes chewy bones, yummy soups, rice and juicy meatballs, of course without salt, to make them drool. The owners can enjoy Indian, continental and Thai in their brunch. Pal, Gunveena��s English Cocker Spaniel and Tia Marie, Sunila Etia��s Golden Retriever met each other for the first time at the brunch. Gunveen and Sunila are regular guests to the hotel. As was expected, Pal and Tia were in a playful mood and enjoyed their time to the fullest. While Tia was in a mood to run around the garden, Pal also seemed to agree with the idea of a walk along the hotel. Sunila and Gunveen say, a�?It’s a great opportunity to spend time with him and also help him make friends. I knew he was friendly but this makes you confident that they love making buddies and meet them too.” With many pet lovers coming forward for the brunch, it is an opportunity to exchange pet grooming, diet and special care ideas with others. Mohanchandran, General Manager of Taj Krishna, beams, a�?Hyderabad loves its pets and we are thrilled to give a platform like this. Ita��s never fun to leave your pets behind, so we wanted to create a space where pet owners can not only take their pets out with them; but also to socialise with other pet owners with great treats for the furry ones.a�?